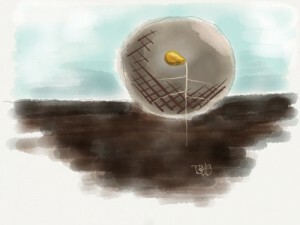 Seed balls are easy to distribute quickly over distances. They can be thrown, slung, or flung much farther than one could throw a seed. Seed balls commonly have fibrous organic matter (ours do), that helps hold the seed ball together upon impact, guaranteeing safe delivery. Surface conditions can be dry, overly hot or cold, and windy making life hard on a germinating seed. Seed balls buffer these harsh conditions. The clay and organic matter in our seed balls has a very high surface area and holds a lot of water. This helps retain moisture, facilitating germination and growth of the seedling. Rich compost, mostly from food and garden scraps, provides nutrients and water holding capacity. Bokashi and bokashi compost tea. Bokashi is produced through a traditional anaerobic Japanese fermentation method. We lightly compost the bokashi in aerobic conditions to break down the compost a bit more. It has a very low pH. Vermicompost. The vermicompost is wonderful for seedlings. The well-digested compost has loads of available nutrients for the seeds. It also has a lot of wood fiber from paperboard that we recycle in the worm bin. This helps hold the seed balls together. It has a high pH. Coconut coir, this buffers highly active chemistry as well as boost moisture retention. We use the acid bokashi and the alkaline vermicompost in balance to provide the right pH range for germination. The root emerges before the leaves. 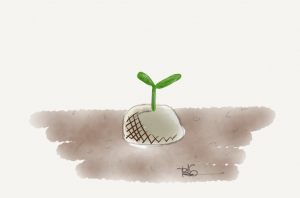 Seeds stay dormant until very specific conditions trigger germination. By buffering the variability in the seed’s environment, seed balls provide a lengthened interval for the seed to safely germinate when conditions are ideal. Our seed balls have a mix of natural clay, compost, vermicompost, and post-ferment bokashi. These composts not only have a wealth of nutrients for the seedling, they also have a special community of naturally occurring microorganisms. The microorganisms further break down the organic matter in the seed ball making additional nutrients available as the plant grows. There is mounting evidence that microbes in the bokashi inoculate the soil and may provide lasting benefits to the plants at the site (Yan and Xu 2001, Shao et al 2008, Dou, Komatsuzaki, and Nakagawa 2012). 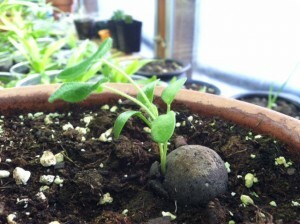 A seedling emerges from a seed ball. Although seed balls protect seeds from birds and rodents, plants grown from seed balls can contribute to biodiversity and provide color and food sources for creatures on the landscape. They can improve soil fertility when containing fine and deep rooting species or species that favor nitrogen fixing symbionts. Seed balls can help enrich the landscape in neglected areas such as roadsides and abandoned lots. You’ll notice that we don’t ship every kind of seed ball anywhere. All plants have their place, but also could become problems in some other regions. We use current research to identify safe areas where we can sell our seed balls. In your hands, they’re powerful agents of change (for clods of dirt)!